August 5, 2017 will be the five-year anniversary of the tragic mass shooting in Oak Creek, Wisconsin, where a known white supremacist entered a Sikh gurdwara and murdered six people and injured many others. SAALT will be in Oak Creek on August 5th to join our community and national partners for the annual Chardi Kala day of remembrance and honor those who lost their lives during this tragedy. When we go to Oak Creek, we want to bring as many voices of love and support with us as we can. 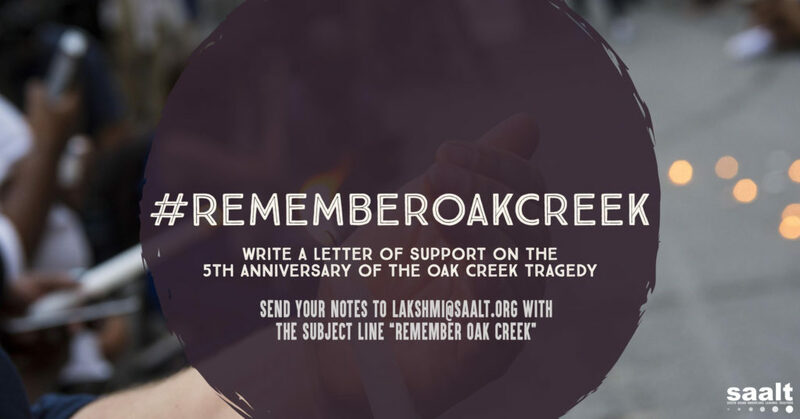 For those of you who can’t make it, please email a brief message of love, support, or solidarity to our communities there using the subject line “Remember Oak Creek” to lakshmi@saalt.org by Thursday, August 3rd. We will also be sharing a series of reflections by community leaders next week through our blog and on social media. We hope that you can take a few minutes to write a message of reflection and strength to our communities. We’ll hand deliver these notes so that our communities know you have their backs, you have them in your hearts, and that we’re all #United4Action. As we observe this anniversary, we must take a moment to see this tragedy in the broader context of racial injustice in our country and the tremendous spike in hate violence our communities are experiencing at this time. Our diverse communities continue to be the targets of discriminatory government policies and violent attacks. Our response must continue to be unity. Thank you in advance for writing a letter of support, and thank you for always staying committed to our ongoing mission of justice and dignity for all.